A native of Venezuela, Portland Timbers head coach Giovanni Savarese came to the United States to play at Long Island University and started a 20-year pro career in 1994 with the Long Island Rough Riders of the United States Interregional Soccer League. He was an original member of the MetroStars and in addition to playing for New England and San Jose in MLS spent time with clubs in Italy and England as well as his home country, for which he played 30 times and scored 10 goals from 1998 to 2001. After retiring as a player, he rejoined the MetroStars in 2005 to direct their youth development programs but two years later was fired in a dispute with team management. When the Cosmos started ramping up its competitive operations in 2010, he came aboard as head of its academy programs and in November, 2012, he started a successful run as head coach. 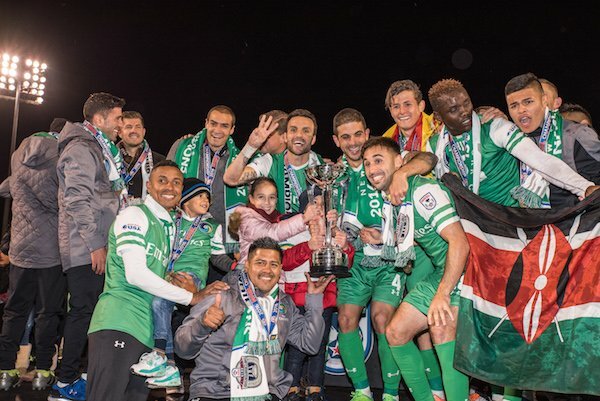 Savarese, 46, won three NASL titles with the Cosmos (2013, 2015, 2016) and last November led them again to the championship game, which they lost to San Francisco Deltas, 2-0. In December, he left the Cosmos and was hired by the Timbers. SOCCER AMERICA: When you were announced as Timbers head coach, you remarked that one aspect of life in the Northwest is that people don’t carry umbrellas. Now that you’ve lived there for a few months what have you learned about what the team and the sport mean to the city of Portland? GIOVANNI SAVARESE: I’ve been to a lot of places in this country but there are some places I haven’t been lately in the transformation of soccer in the United States, so I cannot confirm this, but one thing I can say about why Portland is a soccer town is it goes beyond the passion of the club on the field. The city breathes and lives Timbers. It is a big deal. It is the club to follow. The logo is everywhere, the players are recognized everywhere they go. So it goes beyond that amazing environment in the stadium. Soccer is an important part of the community. From what I have seen, Portland can claim to be the Soccer City in the U.S. I haven’t been in some places lately, like Orlando and Atlanta, which I know have grown so much in the latest days, but I still believe that what I see here in Portland has been amazing. SA: MLS teams these days are large-scale operations. In the case of Portland, there is the Timbers 2 reserve team and academy teams as well as the NWSL Thorns. The league has placed a great emphasis on player development. How do you see the role of Timbers 2 and USL competition in regards to the Timbers’ objectives? GIOVANNI SAVARESE: I believe the USL competition has been growing more and more. I still think that some clubs are taking it to a different level than others. Those teams that want things at a higher level are more competitive. You want players in competitive matches so they can develop and grow in a faster way. The reality is that the teams and the games are in a good situation. It’s important that all the teams try to play to a standard that is higher, and especially all the MLS clubs need to be on the same page as well. Each club sees it in a different way. The most important thing for us is to see an opportunity to develop players from the T2 team to the first one. SA: Not every team has a USL reserve squad. How do you and your coaches incorporate the first team with Timbers 2? GIOVANNI SAVARESE: I don’t know exactly what the future will be for the team, but right now, I intend to unify the first team and T2 to work in a much better way. Right now, the first team trains at 10 o’clock and the T2 team trains at 10:30. So in that first 30 minutes I can organize things so in the case of, for example, I need an extra player or three players, I can go to the coach and find out who has been training well and has looked good in the games and deserves to be with the first team. Those players will be sent to the first team and train with the first team sort of as a reward. We have the teams train at the same time so if a player gets injured in our team, we can bring him over from the T2 team. At the same time, if a first-team player needs extra minutes or extra training or playing with T2, he can work with both teams. So we are on the same page on the field interacting with the players. Also when T2 players come in at 10:30, they interact with the first team at lunch, during the gym sessions, so there is a relationship between the first team and the second team and the players feel they are part of one team and one club. They can integrate a lot easier to the first team. SA: You are a big believer that a winning culture be ingrained throughout a soccer organization. Why is that as important if not more important than having talented players and good coaches? GIOVANNI SAVARESE: You have to be working with good people because if people don’t respect each other there’s no mentality and the team is not going to win things. It’s not all about being a good player. It’s all about following the same path and creating a strong mentality. For me, the mentality, the locker room, is not an understatement. You don’t win if people are not united on the same path, if they don’t believe in the coach. They can be pissed off at the coach and they might not agree, but they have to work as a unit onto a common goal. Only the teams that do that are the ones that win games and win championships, and have created the culture and mentality where there is respect and those things that are simple but difficult. In those clubs, you have success and longevity. When you see a Juventus, when you see Manchester United, Real Madrid, Barcelona, clubs that create that culture, they are big. Yes they have big players but they are big because there’s a culture, a winning mentality, that allows you to endure. SA: The players know if they don’t measure up, someone will take their place. GIOVANNI SAVARESE: You will be gone soon. These are the standards and the standards are taught to the players and the players end up enforcing those standards on the field and in the locker room. At the end of the day, they feel the result of their success by behaving that way and they will hold everyone to those same standards. SA: And the same applies to you and the other coaches as well. GIOVANNI SAVARESE: 100 percent, because the players expect me to be at my best every practice. My job is to bring them the best practice that they can enjoy and be challenged and grow from it. But it has to be a united effort. Everybody has to be pulling in the same direction even if you’re not happy sometimes with the selections and decisions of the coach. SA: You’ve had to make some tough decisions already, such as the benching of defender Liam Ridgewell. Now that he’s back in the lineup has the matter been resolved? GIOVANNI SAVARESE: Not everything that seems controversial in reality is controversial. People make more of situations than is really there and believe that a coach lost belief in a player. Maybe the coach is just finding different ways for players to play in a much better way and get the best out of them because he still believes 100 percent in those players. Sometimes things are not as controversial as people think. SA: What are the major tenets of your coaching philosophy, of how you want the Timbers to play and what methods you use to attain that objective? 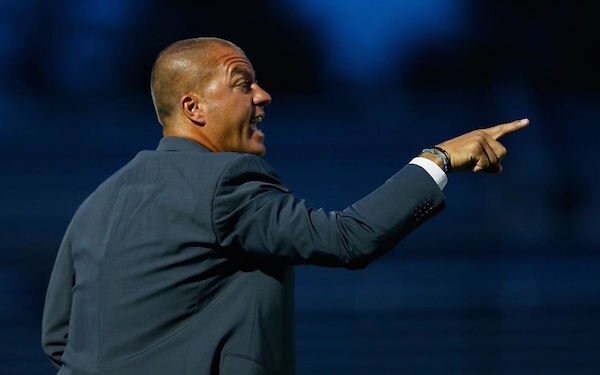 GIOVANNI SAVARESE: In any competitive culture and for me in particular in this opportunity, I have my ideas in regards to soccer and coaching and the way my team needs to play. So many things fall into the same place when we talk about a team’s identity. They might have a style of coaching, but you might have a way to understand that with the players that you have, you have to play a certain way because it’s more efficient and that’s the way the team is going to be able to grow. A coach has to be smart enough not to stay only on one idea but how to develop it little by little and understand what will be the best situation for the players that you have. Every coach is different and every coach’s players are different. There are different layers of importance to me as a coach. Yes, you want good results but you also want to build a strong group and you want also that when the team becomes better as a team, you can develop the players because they understand the game in a much better way and you build them up to succeed. They can find the solutions and not just react in one or two ways when something happens in the game. So for me, it’s important to continue to develop the players while you develop the group and help each individual to be a better thinker with a better understanding of the game. SA: You grew up in Venezuela loving the game. Was is strange coming to the United States, where so many other sports were far more popular? GIOVANNI SAVARESE: It was interesting. Even when I was growing up and there was no professional league and all that, I felt there was a community in New York that was really passionate about soccer. Going to play in college, going to play in the Cosmopolitan League, seeing these big teams and professional players going into New York, I think I lived a life that was a little bit different. Right at the moment that I finished college, the Rough Riders started, so I was part of it. Then the MetroStars came around, so I always felt that every year for me was part of the growth of soccer, because four years in college, two years in the USISL, and then MLS. I was part of it. It was comfortably how the sport was growing in the United States. So I never felt that huge gap that some people still feel coming to the United States, because I saw how the game was evolving and those leagues I was in were so competitive, when I came out of college I felt that competition even though there were no professional leagues. SA: Given the size of the country and the battles between various soccer factions, what do you see as the key elements of streamlining the system that develops players? GIOVANNI SAVARESE: We can go many different ways in regards for USL, NASL, MLS and what we had -- the APSL, the A-League -- in the past. The most important thing is there has to be a strong first division, there has to be a strong second division, and you have to be able to fill a good third division. If they raise the level in the second and third divisions, the first division is going to grow a lot more. It’s going to create better players who are more competitive and are better prepared for what will be expected of them in MLS, because they are already challenged every game and know how to play under pressure. You will quickly see the fruits of that situation. You will attract better players and many more cities, but one thing is not just the second division has to be important and big, but also the amateur level has to be very competitive. The amateur level allows you to respect the professional level. In Italy and Spain, the amateur level is very good. The coaches are good and sometimes people start their careers at the amateur level and move to the professional level. Sometimes professional players retire and they go down their amateur teams they play at a level as good as teams in the second or third division. We have to go with what is happening in MLS, in one way or another, because it is important. If eventually it’s going to be promotion and relegation, that will take its course. But if you even want to think about that equation, you have to support the second division and all the other leagues and hold them to high standards. You want those leagues and those teams to have good players competing at a high level. All that is important so that players can develop and this is very important: that they develop when they are younger so they can go through the different layers before they can even consider making it in the first division. I can see why promotion and relegation works in other countries. This country is a little bit more intrinsic, but for me the most important thing is that the base continues to grow and that even the amateur game has to be held to higher standards as well. SA: The 1994 World Cup was the first chance for most Americans to experience the tournament first-hand, but you had already been to a World Cup in Italy. What did that experience mean to you? GIOVANNI SAVARESE: I was coming out of college the year the World Cup was played here, and it was very interesting to see the support for Italy, which is the team I had supported in 1990. It was great to see the support for the United States, but also It was very weird to know there were people in the street who didn’t even know the World Cup was happening in the United States. The biggest sporting event in the world and someone doesn’t know. I found that somewhat strange and weird, but to see how well it was organized and every national team had basically a big following, that was amazing. So it was strange to see people in the street who didn’t know the World Cup was happening but there were not too many of those. SA: Obviously, the 1990 host nation was a bit more involved. SAVARESE:When Italy played, everything was silent. Everything was closed and the other thing was when Italy scored, you would hear big screams and cheers all over the city, in every city. It was years of waiting and so there were great expectations. SA: Being in Rome a few hours before Italy’s first game against Austria meant you couldn’t get a taxi to the stadium. GIOVANNI SAVARESE: Yes, of course. All the taxi drivers were somewhere to watch the game. That was a very good experience, being young, 18 years old, and experiencing the World Cup in Italy. SA: The entire country went into mourning when Italy lost its semifinal against Argentina. What do you remember about that result? GIOVANNI SAVARESE: I was actually in the stadium watching that game in Naples, Italy against Argentina. Contrary to what people say -- that the people in Naples were supporting Argentina because Maradona was playing for Napoli at the time -- they clapped for Maradona but everybody wanted Italy to win. The way the PKs went and the how the game was played -- and remember that Italian team was a very good Italian team -- was tough to swallow for many people. SA: That World Cup marked the U.S. return after a 40-year absence. A run of seven straight appearances ended when it was eliminated from the 2018 tournament last October. In the aftermath of that failure, what do you think can be done with the national team programs and the system that feeds them? GIOVANNI SAVARESE: I’m not saying I have the solutions but in working with the youth, how can you teach a youngster how to succeed after failure? How can you build character after a defeat? How can you be the strongest player on the field after coming off the bench? For me, that is very critical in the United States. I think the U.S. national team had that in the past. The players say, ‘I will never give up, and nobody will have an easy game against us. It doesn’t matter who you are, we are the U.S.’ I think that has to be found again in some way, because we have talented players but what John Harkes and Tab Ramos had, they were never afraid to play against anybody. Not everybody is going to have the same personality but you have to find ways so that that people know how to react in a positive way after an obstacle or a tough moment. Those players in the past knew how to fight for a place in the world. Starting with our youth, there are not a lot of positives right now and we need to find ways to fix it. I’m not saying anything about that group because I really value players. I see [Michael] Bradley when he is 16 with the MetroStars and how he has fought to get where he’s gotten. I would like to see more kids being able to work with adversity. That is one thing that can continue the development of the sport in the United States.